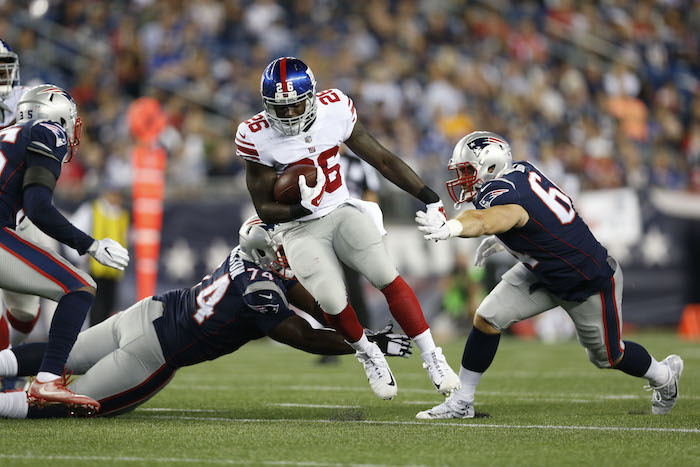 The New York Giants have re-signed free agent tight end Ryan O’Malley, who was not tendered as an exclusive rights free agent by the team, thus making him an unrestricted free agent. The contract is reported to be a 1-year deal. The Giants signed the 6’6”, 260-pound O’Malley to the Practice Squad and then the 53-man roster in December 2017. He played in the regular-season finale but did not have a catch. O’Malley was originally signed as an undrafted rookie free agent by the Oakland Raiders after the 2016 NFL Draft. He spent time on both the Practice Squad and 53-man roster of the Raiders in 2016. The Raiders cut him in September 2017 and he spent a few weeks on the Practice Squad of the Bills. 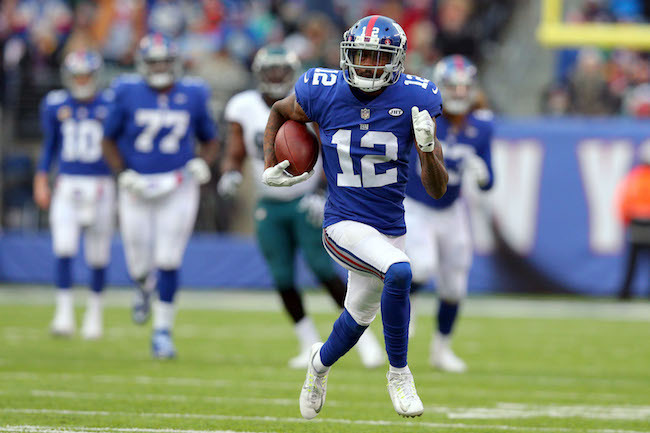 The Minnesota Vikings have signed New York Giants unrestricted free agent wide receiver Tavarres King, who began 2017 with the Giants, was waived in mid-September, and then was re-signed to the 53-man roster in October. He was placed on Injured Reserve with a concussion in December. King played in eight games with three starts in 2017, finishing with 18 catches for 240 yards (13.3 yards per catch) and three touchdowns. King was originally drafted in the 5th round of the 2013 NFL Draft by the Denver Broncos. He spent time with the Broncos (2013), Panthers (2013-14), Jaguars (2014), and Buccaneers (2014-15). 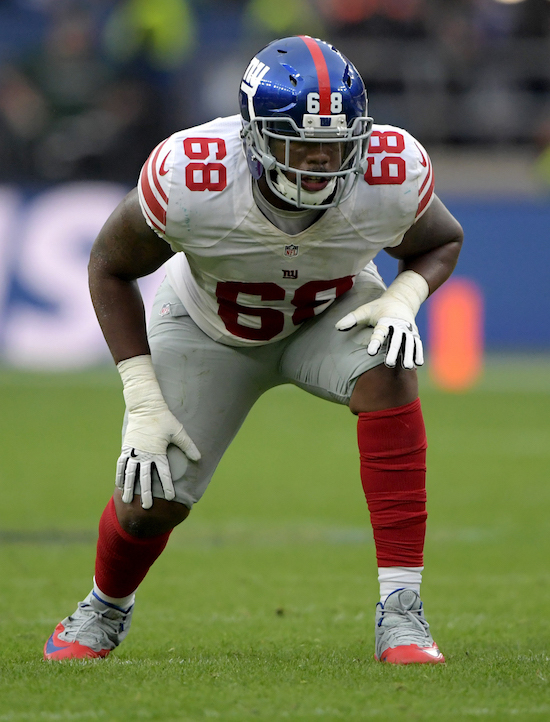 The Giants signed King to the Practice Squad in late September 2015. He played in seven regular season games and the playoff game for the Giants in 2016. For a complete listing of comings and goings, see our New York Giants 2018 Free Agency Scorecard. The New York Giants have hired Thomas Stallworth as the team’s new assistant strength and conditioning coach. Stallworth replaces Markus Paul, who left the Giants for the Dallas Cowboys earlier this offseason. Aaron Wellman, who joined the Giants in 2016, remains the team’s strength and conditioning coach. 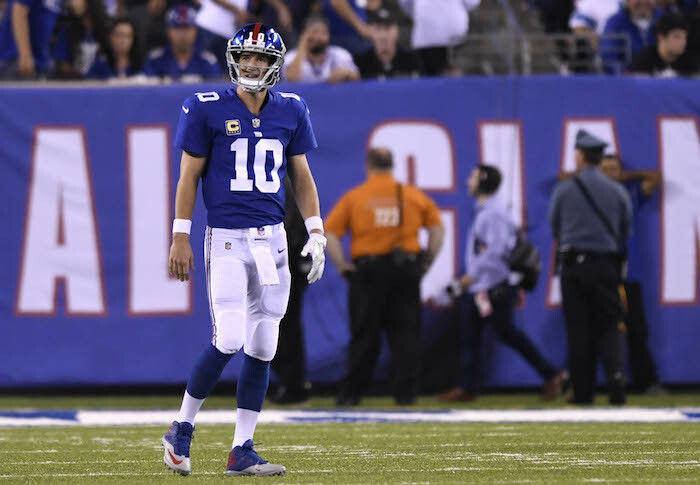 The New York Post and Newsday are reporting that New York Giants quarterback Eli Manning began his annual unofficial passing camp at Duke University on Thursday. 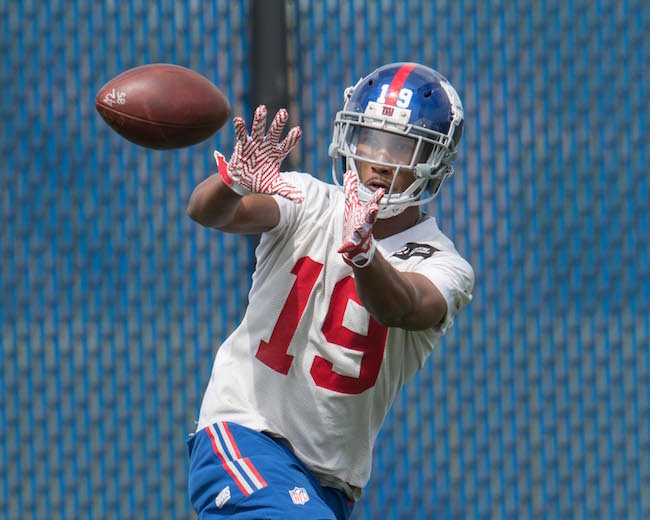 Other players participating include wide receivers Sterling Shepard, Brandon Marshall, and Roger Lewis; tight ends Evan Engram and Rhett Ellison; and running back Wayne Gallman. The workouts are overseen by current Duke University head football coach David Cutcliffe, who was Eli Manning’s head coach at the University of Mississippi from 2000 to 2003. In a bizarre turn of events, New York Giants Head Coach Ben McAdoo announced on Wednesday that cornerback Dominique Rodgers-Cromartie (DRC) has left the team and will be suspended by the Giants. When asked, McAdoo would not answer how long the suspension would last. ESPN is reporting that Rodgers-Cromartie walked out of last Friday’s “recovery day” session. In addition, according to multiple press reports, the Giants were upset that DRC left the bench area and went to the locker room during the second-half of the Giants-Chargers game, although he later returned. ESPN is reporting that the incidents on Friday and Sunday led to a meeting on Tuesday where McAdoo informed DRC that he would be inactive on Sunday night against the Denver Broncos and fined. ESPN says DRC cleaned out his locker and left team facilities on Wednesday. Rodgers-Cromartie told ESPN that he would return to the team on Thursday. 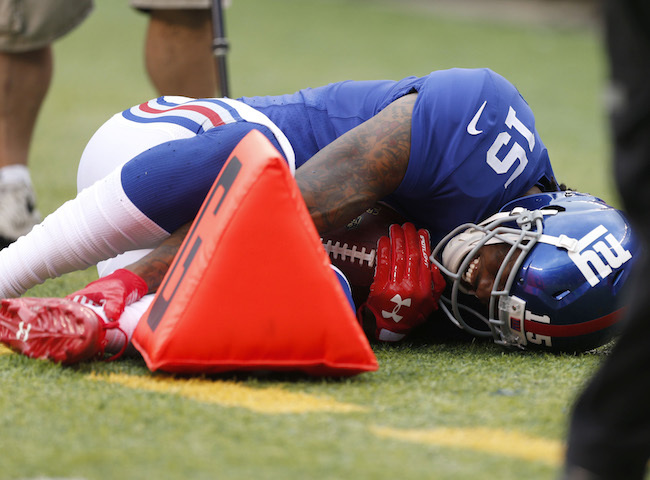 Running back Paul Perkins (ribs), wide receiver Sterling Shepard (ankle), center Weston Richburg (concussion), defensive end Olivier Vernon (ankle), linebacker Jonathan Casillas (neck), and safety Landon Collins (ankle) did not practice on Wednesday. Cornerback Dominique Rodgers-Cromartie (see story above) also did not practice. Safety Jadar Johnson (illness) did not practice. Much more action today to discuss AND we got to talk one on one with DT Dalvin Tomlinson. Fun day with overcast skies and the temperature was MUCH cooler. Even had some gusts wind thrown in. We saw some 7-on-7 and 11-on-11…somewhat close to live/full speed. Wide receiver Brandon Marshall is just a freak of nature. Not only is he massive (tall/long/thick)…but I am surprised to see how well he moves. When he opens up his stride, he can really get behind a defense. He toyed with cornerback Eli Apple, got physical with him at the point-of-attack then was able to turn it up a gear and get downfield. If this guy is healthy, he could be an absolute monster in this offense and role. 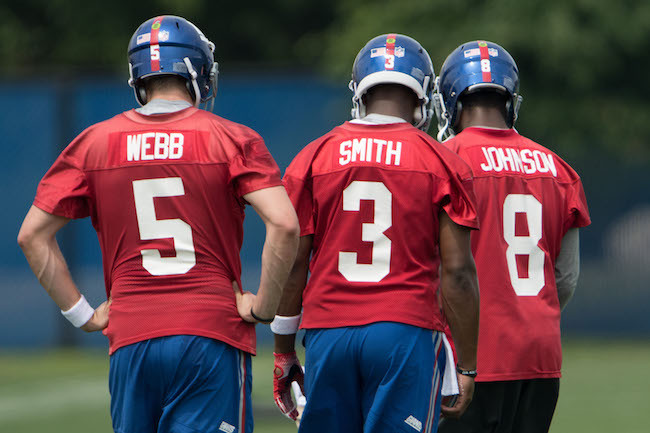 Quarterbacks Josh Johnson and Geno Smith are splitting reps with 2nd/3rd string it looks like. Open competition. Johnson is more accurate and consistent, although when Geno lines everything up and can find his target, he looks very impressive. The key there is confidence and ability to make quick reads. Both were a little shaky in 7-on-7 and 11-on-11…if I had to give a win to one of them it would be Johnson. Can’t say much about the offensive line today, as they still aren’t in pads. Right guard D.J. Fluker is a GREAT guy to listen to. He is fired up about being on a winning team and he said no organization is like the New York Giants when it comes to their passion for winning, for what that’s worth. He really lumbers out there; I think he is certainly destined for right guard play and likely a backup. Good guy to have around. Left guard Justin Pugh looked very stout and powerful in their hand drills. The tight end competition is very up in the air. A bunch of guys are rotating in and out with the 1st team. Ben McAdoo says its one of the toughest positions to play because of the variety of assignments, starting positions…etc. Matt LaCosse made a couple of nice grabs up and away from his body on the full move. He is very slight-framed compared to the rest of these guys, but his ball skills are noteworthy. Jerell Adams is an impressive specimen but he is a little shaky as a mover/athletically. Rhett Ellison doesn’t stand out but I don’t expect him to until the pads are on. His game is physicality. I put a lot of attention on quarterback Davis Webb. I made simple + or – signs next to his name for positive or negative throws. He was flip flopping all day. No big deal yet…just noticed there isn’t a natural high level of accuracy just yet…he was errant on a few easy ones. Many completions were guys having to turn back for the ball or leap up. He did connect with wide receiver Travis Rudolph on a great timing route up the seam. He has plenty of zip, he is the best athlete within the group, and when he has everything lined up he looks high-level-caliber. Don’t have much on the running backs yet. Wayne Gallman has a noticeably different style and level of patience to making his cuts than the rest of them. He is explosive and fast, but in drills where patience and cuts upfield were the focus, he didn’t show it. Khalid Abdullah, however, does. He was very impressive in these drills but equally unimpressive in blitz pickup drills. That is the quickest way to the doghouse for a running back besides fumbling. Overall, VERY competitive group. Especially the defensive backs. They took so much pride in beating the offense in 7-on-7 and 11-on-11. Very intense group that likes to get after it as a whole. 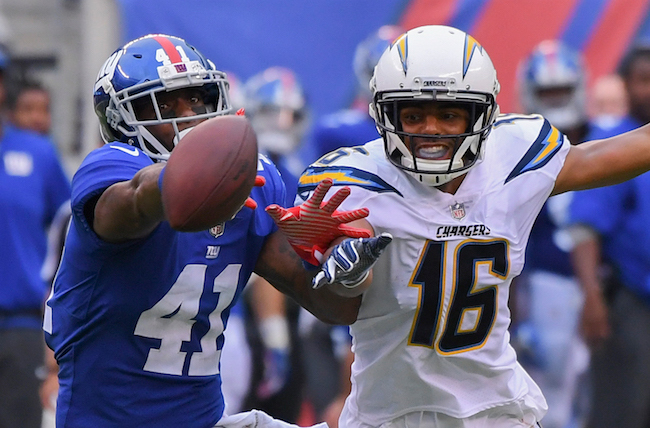 Cornerback Eli Apple was pretty back and forth, but he struggled when matched up against wide receivers Brandon Marshall or Odell Beckham, Jr. Tools-rich, but still unsure about the development. Cornerback Janoris Jenkins made an excellent INT going up for it against wide receiver Sterling Shepard, but was beat prior to that in a similar situation against Marshall. It was interesting to see how pumped the defense got when he came down with the INT. Robert Thomas and Damon Harrison lining up next to each other at defensive tackle. Talk about a beefy duo. Don’t sleep on them as pass rushers though, they can really move and push the pocket. Didn’t get to see pretty much anything else from the defensive line, they were on the other side of the complex for almost the entire time. I tried to watch middle linebacker B.J. Goodson against the pass, he wasn’t challenged much though. He does look explosive and quick though. He undercut some of the interior offensive line on running plays very well. The backup defensive backs saw a lot of rotating…those spots are very up in the air I think. Nobody is standing out just yet, but they like to compete. Cornerback Donte Deayon. A player his size (5’9/163) is going to have a hard time making a roster in the NFL, but he is certainly making his case. He moves quicker and faster than everyone. He is a fiery competitor, maybe the most so when it comes to the defensive backs. He adds return value, he held up in coverage. I have a feeling about him so far. Wide receiver Odell Beckham. We know he is a star. We know he is an amazing talent. But the amount of time he spends on the smallest aspects to his game is nice to see. During down time, he was working with Sterling Shepard and how to read a cornerback when coming off the line to get in to his route. Prior to that, he had a coach throw him about 15-20 balls where Beckham was stationary with his back to the ball…he just looked up in the air and waited for the ball to enter his line of vision. Then he went to make that difficult over the shoulder catch…and yes he caught every one. Offensive lineman Brett Jones. Are we overlooking this guy as a possible backup inside? Arguably the top option if any of the three starters go down? He gets looks inside and out and he just seems to do everything right, in an exaggerated way. I love his build. He is a powerful, mean blocker and I am really looking forward to seeing him go live when the pads go on. There might be something there with him. If I had to guess, I think the guys will be getting after it a little more tomorrow considering they are off on Monday. Well obviously Sy’56 is the class between the two of us and I will be supplementing his observations to you guys during camp and serving in a support role. The first clip shows that the defensive line and offensive line players are doing a different set of warm ups on opposite sides of the field. This is a new view for me as opposed to prior camps I’ve attended where the players were all doing the same warm ups. There was no active player on the bikes today – and one player was held out, safety Jadar Johnson, because he was ill according to Coach McAdoo. 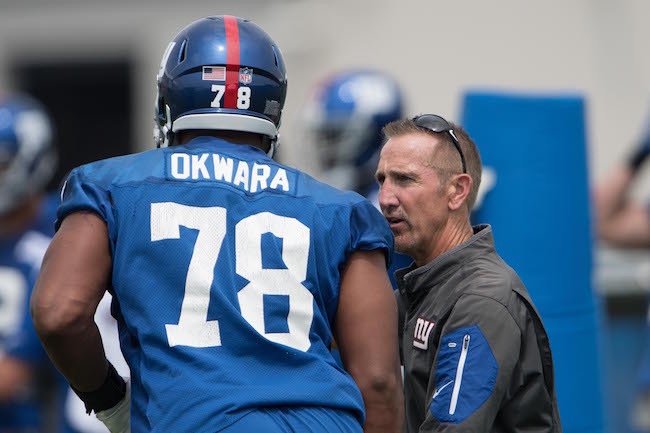 Take what you will about the new training staff – maybe it’s a fluke and still needs some more data to evaluate, but the Giants were relatively healthy last year and throughout the off season. They come into camp in very good health overall and with no steady stream of players headed to the sidelines. Today’s practice was much more of a full practice than yesterday. The second practice clip shows a catch, run and hit sequence that was run at the beginning of practice. While this was happening centerfield – on the right side of the field in the third clip sequence there was a group practicing coming out low from under a bar and hitting upward into a small square pad on a player target. The next set of clips goes back and forth between a sequence of timing reps on one side of the field and the low to high practice that went from one on one to, two on two, to a larger formation. I have a clip in there that follows Coach McAdoo for a couple of minutes. It seems to me that he blends more in with the surroundings than we have been used to in the past. Coach ribbed me after practice for filming him. The next two clips are of Devon Kennard, who parked himself in front of me and he stands out as a really solid big dude. He participated in a special teams change of direction drill that was run for several minutes. Sy had me look over to the right and there was Odell Beckham, Jr. taking over the shoulder catch practice. Odell really stood out on the field today, making a number of catches that showed off his incredible game speed. Then the fullbacks came to the side line and I couldn’t help but notice that these guys are not very big – Rhett Ellison and Will Tye are huge in comparison to these two. There’s clips of Davis Webb under center for a few reps, then some clips that show a bunch of offensive lineman and featuring Adam Gettis and Adam Bisnowaty standing next to each other. Biz dwarfs Gettis. Then there are clips of 11-on-11’s first with Eli Manning – that include a nice fake and a strike to Odell. Then Geno Smith behind center. Smith seems to be the least accurate QB out there. Then I have a clip of Ellison and Tye, and then Paul Perkins dwarfed by John Jerry. In 7-on-7 drills, wide receiver Brandon Marshall made a nice catch against cornerback Janoris Jenkins on an underthrown ball from quarterback Eli Manning. Tight end Evan Engram made a nice catch on a pass thrown behind him. Cornerback Janoris Jenkins intercepted a deep pass from quarterback Eli Manning to wide receiver Sterling Shepard. Geno Smith was the second-team quarterback. Mykkele Thompson received reps at cornerback. Quarterback Eli Manning hit wide receiver Odell Beckham, Jr. on a deep pass over the middle for a touchdown. Beckham made a number of nice grabs on the day, including a diving sideline reception against cornerback Eli Apple. 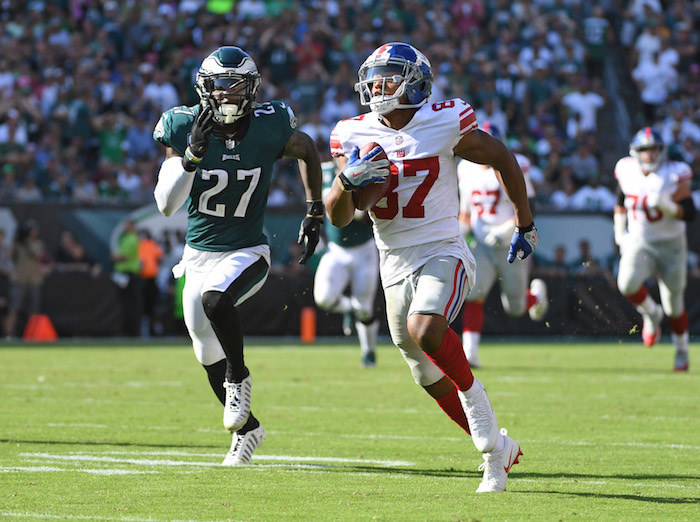 Cornerback Eli Apple broke up two quarterback Eli Manning passes into the end zone, the first to wide receiver Odell Beckham, Jr. and the second to wide receiver Sterling Shepard. Wide receiver Jerome Lane made a nice diving catch of a low pass from quarterback Geno Smith. Defensive end Avery Moss flashed on his first pass rush attempt. Quarterback Geno Smith completed a rollout pass to tight end Matt LaCosse. The third training camp practice will be held on Sunday, starting at 10:55AM. The training camp schedule is available at Giants.com.